Each year that passes, providing a Christmas list seems to get harder and harder. In a society where we tend to buy the things we want, when we want, a time for providing loved ones with gift lists seems to be fewer and far between. There isn't particularly anything that I need and at first there wasn't that much that I could think of that I wanted this year. But then I thought about creating a gift list inspiration blog post and all of a sudden I've discovered lots of things that I quite like the look of, actually needing them is a completely different matter. 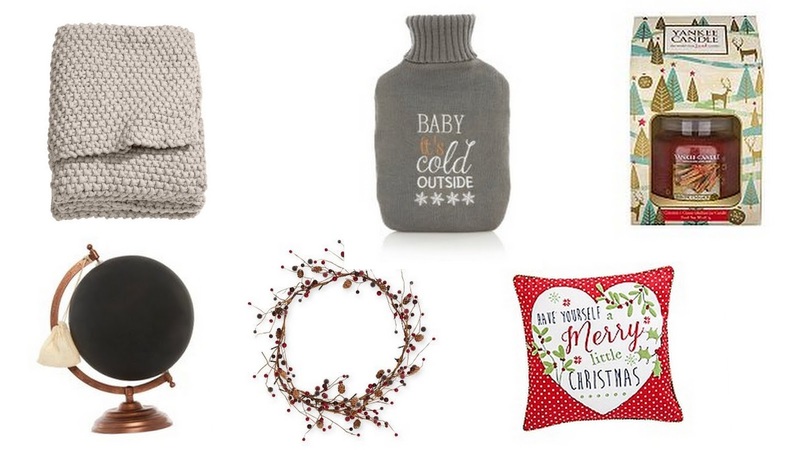 *Moss Knit Blanket from H&M £49.99 *Baby It's Cold Outside Hot Water Bottle from Asda £5 *Yankee Candle Christmas Sparkling Cinnamon Boxed Medium Jar from Boots £16.99 *Chalk Globe from Asda £15 *Lit Red Berry & Pine Cone Garland from Next £20 *At Home With Ashley Thomas Red Merry Christmas Cushion from Debenhams £22.40. *Woodland Animal Socks from Next £8 *Metal Tab Shoulder Bag from Accessorize £35 *Red & Yellow Check Scarf from Primark £5. What have you got on your Christmas list this year? Great picks, I've really taken a shine to the hot water bottle cover!